Watermelon is the fruit of the summer. It awaits you at the door of every grocery store come June, and the sweet seedless melon calls to you to reenact the scene from Dirty Dancing. As easy as watermelon is to snack on straight from the slice, it's also wonderful in a variety of easy recipes. Here are three ways to use watermelon in your summer camping (or backyard) meals. Cut the cucumber and watermelon into medium-sized chunky cubes. In a large bowl, toss watermelon, cucumber, herbs, oil, and lime juice. Add salt to taste. Crumble the cheese on top to finish. Serves four. Combine watermelon, onion, lime juice, jalapeño, and 1 tbsp of olive oil in a bowl with a dash of salt. Heat the remaining 2 tbsp oil in a fry pan over a stove or campfire grate. Season filets with a light coating of salt and chili powder, then place in the pan and fry two at a time. Fry the fish until the filets are golden and flaky (5-7 minutes), then remove from pan. Heat four tortillas over the flame and place on plates. Top with fish filet, watermelon salsa, avocado slices, and cilantro. Serves four. Combine all ingredients in a blender and blend until a smooth liquid. Garnish glass with a watermelon slice or mint leaves. Serves four. Any way you slice it, watermelon is a delicious and versatile treat. 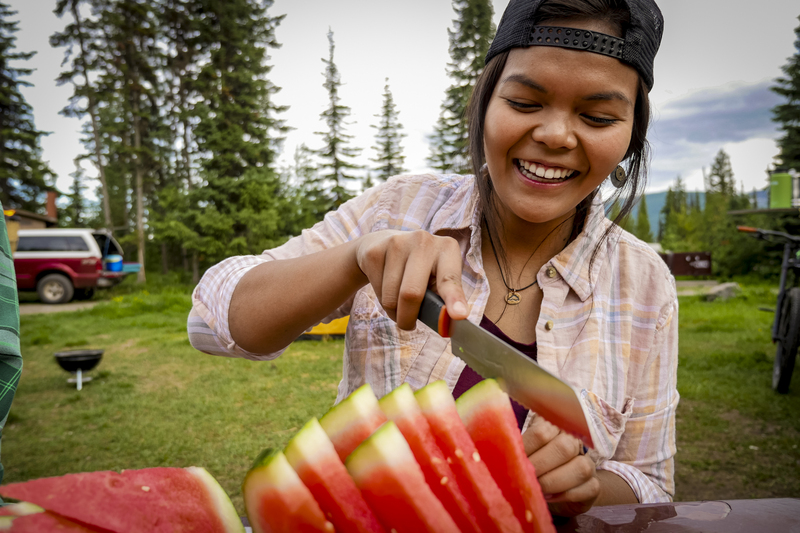 Grab a watermelon next time you head out for a car camping adventure or road trip and enjoy a delicious salad, dinner, or cocktail with the sweet taste of summer.